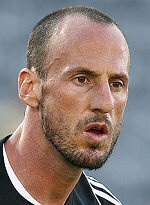 The New York Red Bulls announced today that Preston Burpo has been added to the coaching staff as goalkeepers coach. Burpo, a former MLS goalkeeper, previously coached on Jesse Marsch's staff with the Montreal Impact in 2012, and with D.C. United for the 2013 and 2014 seasons. "I'd like to thank the Red Bulls organization for giving me this opportunity," said Burpo on Monday. "I'm excited to get to work with a great group of guys here, and to have the opportunity to contribute to the success of this team." Burpo, a native of Bethesda, MD, started his playing career with USISL teams in 1995 and had a stint with Jamaican club Harbour View FC before signing with Seattle Sounders FC, then in the United Soccer League, in 1997. Burpo played nine seasons with Seattle before moving to MLS side Chivas USA in 2006, where he was a teammate of both Marsch and current Red Bulls midfielder Sacha Kljestan. In all, Burpo made 59 career appearances in MLS, 22 with Chivas USA before stretches with the Colorado Rapids and New England Revolution. After spending one season as a scout with the U.S. Soccer Federation, Burpo joined Marsch's staff ahead of the Montreal Impact's inaugural season in 2012. He subsequently spent two seasons as the goalkeeper coach with D.C., overseeing Bill Hamid's MLS Goalkeeper of the Year season in 2014. Prior to his professional career, Burpo graduated from Southern New Hampshire University, where he played from 1991 - 1994, and remains eighth on the school's career shutout leaders list, with 17.